Anyway, that is No-no Lulu’s handiwork. Clearly, she has decided that Christmas will come early this year. And she has also decided that she should open my sister’s gift to me. You know, the gift my sister went to my favorite store to get and had professionally wrapped? Yeah, that gift. Sigh. 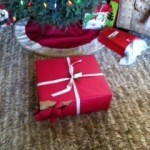 I guess there’s nothing left to do…but open the gift myself, right? 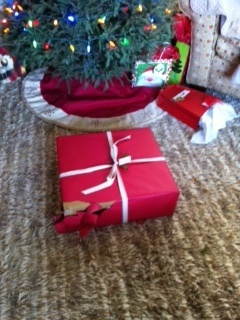 I mean, I couldn’t possibly allow this partially eaten gift to be under my crooked, undecorated tree. Right?